One of the reasons I am excited about the rise of data journalism is that journalists are doing amazing things with visualization. At the same time, one of my frustrations with academic research is that the general quality of visualization is so poor. 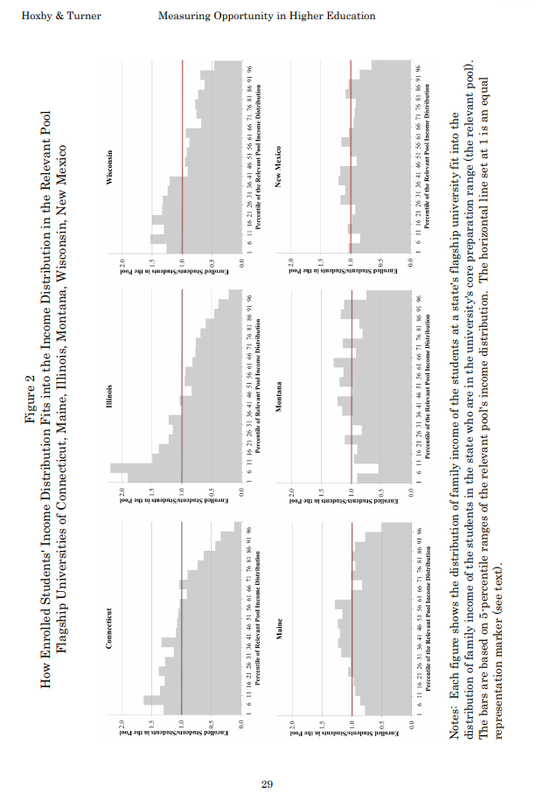 One of the problems is that most academic papers are published in grayscale, so the figures don’t use color. But most papers are read in electronic formats now; the world is safe for color! Another problem is the convention of putting figures at the end, which is an extreme form of burying the lede. Also, many figures are generated by software with bad defaults: lines are too thin, text is too small, axis and grids lines are obtrusive, and when colors are used, they tend to be saturated colors that clash. And I won’t even mention the gratuitous use of 3-D. But I think the biggest problem is the simplest: the figures in most academic papers do a poor job of communicating one point clearly. 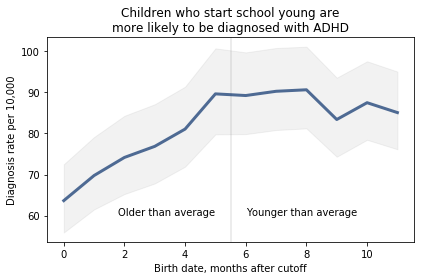 I wrote about one example a few months ago, a paper showing that children who start school relatively young are more likely to be diagnosed with ADHD. 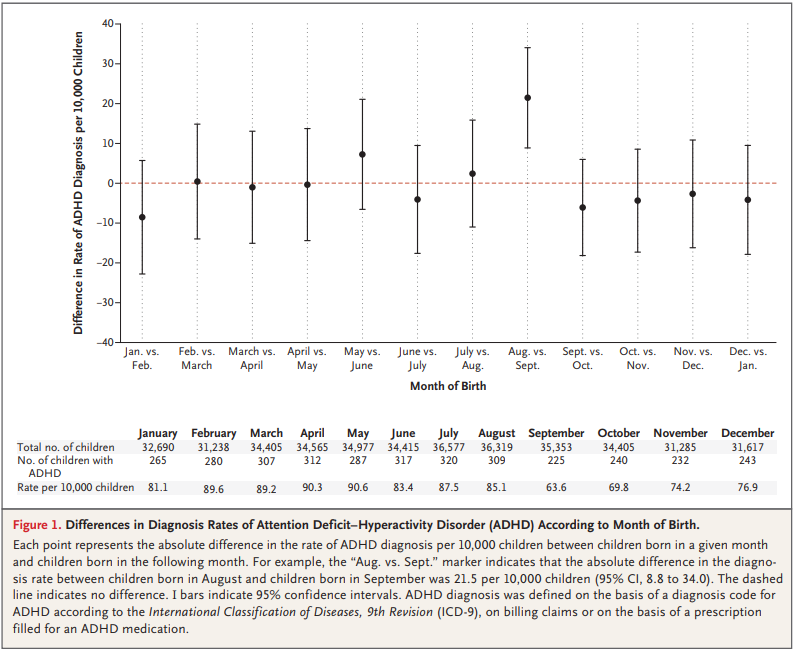 Instead of plotting the difference between successive months, I plotted the diagnosis rate for each month, which makes it possible to see the pattern (diagnosis rate increases month over month for the first six months, then levels), and the magnitude of the difference (from 60 to 90 diagnoses per 10,000, an increase of about 50%). I shifted the horizontal axis to put the cutoff date (September 1) at zero. I added a vertical line and text to distinguish and interpret the two halves of the plot. I added a title that states the primary conclusion supported by the figure. Alternatively, I could have put this text in a caption. I replaced the error bars with a shaded area, which looks better (in my opinion) and appropriately gives less visual weight to less important information. The title explains what the figure shows clearly: enrollment rates are highest for low-income students that qualify for Pell grants and lowest for low-income students who don’t qualify for Pell grants. To nitpick, I might have plotted this data with a line rather than a bar chart, and I might have used a less saturated color. But more importantly, this figure makes its point clearly and compellingly. Under the 6-point system, there is no visible difference between ratings for male and female instructors. Under the 10-point system, in the least male-dominated subject areas, there is no visible difference. 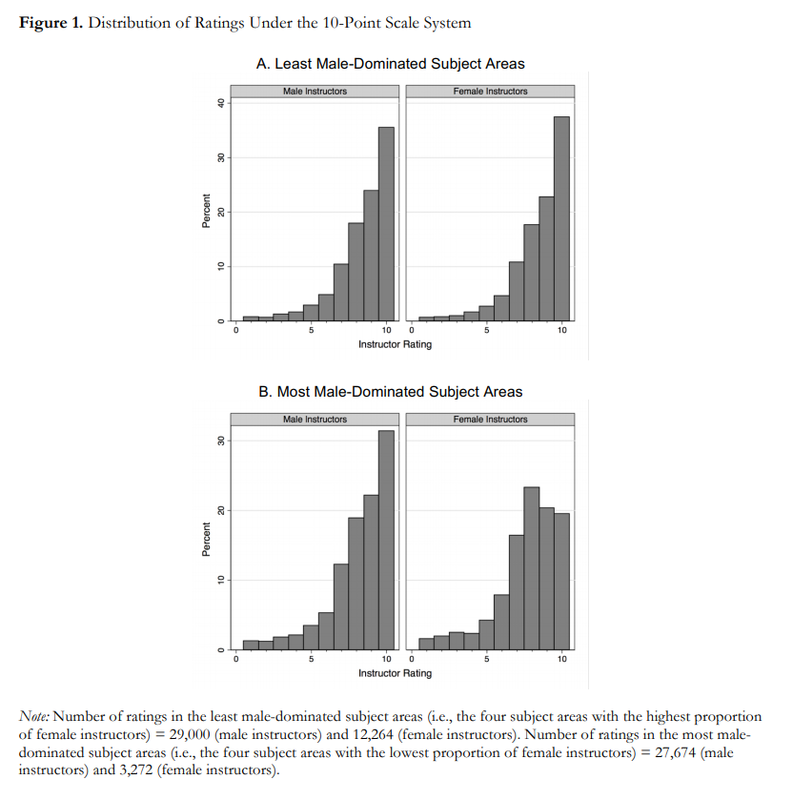 Under the 10-point system, in the most male-dominated subject areas, there is a visibly obvious difference: students are substantially less likely to give female instructors a 9 or 10. This is an important result — it makes me want to read the previous 43 pages. And the visualizations are not bad — they show the effect clearly, and it is substantial. Understand the magnitude of the effect in practical terms? You can get the data you need from the figures, at least approximately. And your visualization doesn’t have to be fancy; you can send something hand-drawn if you want. The point of the exercise is the design, not the details. I will post submissions in a few days. If you send me something, let me know how you would like to be acknowledged. Students in the most male-dominated fields are less likely to give female instructors top scores, but only on a 10-point scale. The effect does not appear on a 6-point scale. There are definitely things to do to improve this, but I generated it using Pandas with minimal customization. All the code is in this Jupyter notebook.